Tart blackberries, sweet pears and wholegrain muesli give a great contrast of flavours and textures. Preheat the oven to 180°C, gas mark 4. Lightly grease a 1-litre shallow ovenproof dish. Place the blackberries and chopped pears in the bottom of the dish and sprinkle over the lemon juice and 1 tablespoon of the sugar. Set aside while you make the crumble topping. Place the flour in a bowl, add the butter and rub in lightly with your fingertips until the mixture resembles breadcrumbs. Stir in the remaining sugar and the muesli. Sprinkle the crumble topping over the fruit and press down lightly. Place the dish on a baking tray and cook for 35-40 minutes until the topping is golden brown, the blackberries are just releasing their juices and the pears are tender. Allow to stand for about 10 minutes before serving with clotted cream. Spelt flour contains a more digestible form of gluten than standard flour, and has a lovely nutty texture. Replace with standard plain flour if you prefer. 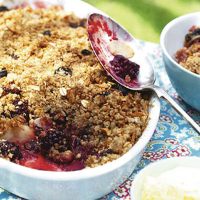 This crunchy crumble demands a chilled fruity red wine.